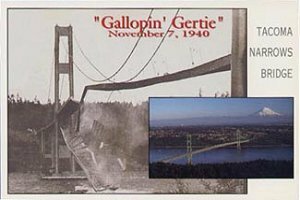  Tacoma, Pierce County: At 11:00 a.m. on 7 November 1940, Barney Elliott captured footage of the Tacoma Narrows Bridge collapsing due to wind force. This video has gone on to become famous among engineers and high school physics classes. 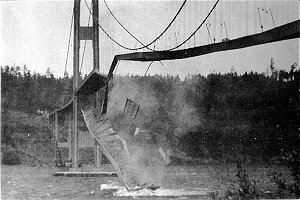 The Tacoma Narrows Bridge is on State Route 16 between Tacoma and Gig Harbor, WA. 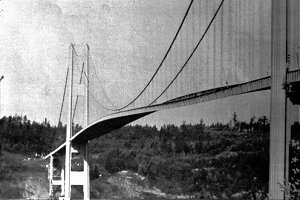 It has since been rebuilt.